Website legal documents have always been important but with the GDPR (General Data Protection Regulation) taking effect recently, it's more vital than ever. If you don't have these documents or didn't update them for the GDPR, now is the time to act. Take action and protect yourself from legal risk and fines! Why? It's required by law! Website owners like yourself are required by US law to comply with privacy and cookie laws. It's also required by Google if you use Google Analytics or Google AdWords, and by Facebook, if you use their advertising services. As of May 25th, it's also required by the new GDPR for all EU visitors. Why? It provides website usage rules to protect you! The Terms and Conditions are rules which your users are asked to agree to in order to use your website. These rules reduce and limit your legal liability for technical problems and errors with your website that are out of your control. It defines your legal relationship with your visitors and customers. If you provide a service, sell a product, offer content, advice or opinions using your website, you should have terms and conditions to protect yourself and your business. Why? To transfer responsibility to the visitor and protect you from lawsuits and damages. The website disclaimer covers some key foreseeable events and scenarios and works to transfer the responsibility and shift the risk from you to your website visitor. It should be written to avoid as much misunderstanding as possible of who bears the risk in as many possible contingencies as possible. This is the kind of thing where the free version of these is probably not the best option, but you don't have to spend lots of money on it either. 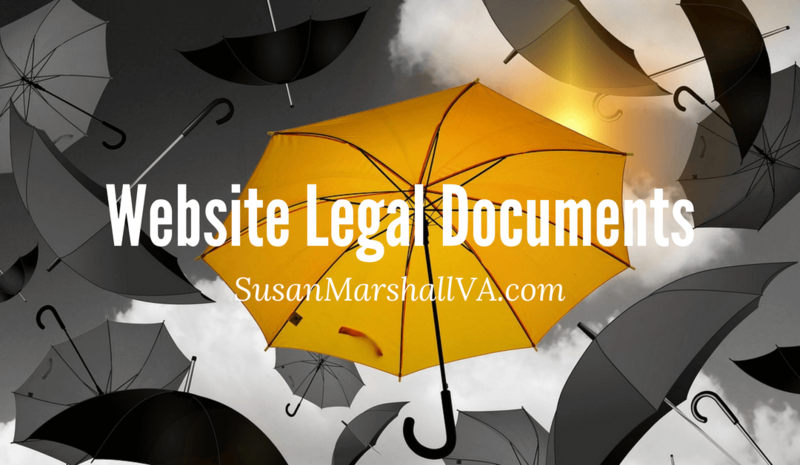 Most of us just need the standard website legal documents. I purchased mine recently from a tip by a reputable website marketer that I follow and I've arranged for you to get the same deal that I got. They've even created a page just for my visitors here, https://www.disclaimertemplate.com/susan-marshall/. These documents are drafted by an attorney and certified information privacy professional and can be updated and implemented on your website in an afternoon. For a limited time only, forward me your receipt and I'll install them on your site free of charge. The receipt must reflect Susan Marshall Special Package. No matter where you get these documents, the important thing is that you have them and can feel confident that they will protect you. I hope you found this post easy to read, easy to understand and most of all helpful. If you have questions or comments please leave them here.